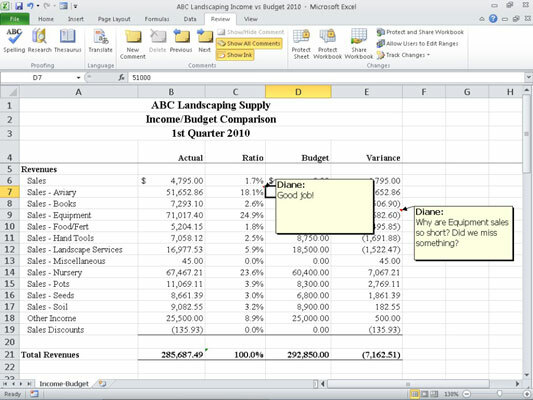 You can add a cell comment — an electronic version of a sticky note — to any cell in an Excel 2010 worksheet. Comments allow those reviewing a worksheet to provide instruction, for example, noting how a complex formula works, entering thoughts, questions, and even specifics about the type of information that the end user should enter into the cells. Select the cell that needs a comment. On the Review tab, in the Comments group, click the New Comment button. A yellow comment box with your name and a blinking cursor appears. With the comment box open, you can drag the lower-right corner of the comment box to make it larger. Comments can be up to 32,767 characters in length. Excel 2010 indicates commented cells with a red triangle. Excel accepts the comment and displays a red triangle in the upper-right corner of the commented cell. Point to a cell containing a red triangle to display the comment text. Select the cell with the comment you want to edit. On the Review tab, in the Comments group, click the Edit Comment button. The yellow comment box displays. Make any desired changes to the comment, and then click outside the comment box. You can edit cell comments as necessary. Click a cell with a comment and pause your mouse over the comment indicator. Excel displays the comment text; but as you move your mouse away from the comment indicator, the comment text hides. Click the Next button or the Previous button in the Comments group of the Review tab. Excel displays another comment. Click the Show/Hide Comment button in the Comments group of the Review tab. Excel keeps the current comment displayed on the screen until you click this button again. Click the Show All Comments button in the Comments group of the Review tab. Excel displays all comment boxes on the current worksheet. Click the Show All Comments button again to turn off the comment display. Use the Show All Comments button to view multiple comments on screen at one time. To delete a comment, select the cell with the comment and click the Delete button in the Comments group on the Review tab.